We are proud to provide Invisalign at our Upper West Side dentist office! Interested in finding out more about Invisalign? Come visit us for a complimentary Invisalign consultation! Drs. 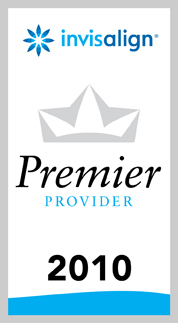 Paul and Benjamin Ganjian have been awarded Invisalign's "Premier Provider" status. Click here to request an appointment, or call our Upper West Side dentist office today at 212-362-3360! Invisalign® is an exciting new technology that straightens your teeth with a series of clear, customized, removable aligners. The aligner is a thin piece of medical grade plastic that fits over the teeth like a glove. Hardly anyone can tell you're going through treatment, and because the aligners are removable, you can eat whatever you want during treatment. This puts us in the top 5% of Invisalign practitioners in all North America! Throughout treatment, we will arrange for check-up appointments about every six weeks to make sure that treatment is progressing as predicted. As treatment nears completion, Dr. Ganjian will design a retention plan to help you keep your smile for life. You can relax knowing that your treatment is being diagnosed and carried out by an Invisalign-trained orthodontist, and enjoy the convenience of treatment at our office. We will even be able to finish your case with tooth whitening dentistry if you desire, to give you a gleaming, bright smile. Call 212-362-3360 to set up an appointment at our Upper West Side dentist office.